Travel can be grueling on the body, and long flights can certainly take their toll. There are many preventative steps travelers can take to ensure easy and smooth voyages, including drinking loads of water, healthy eating to keep up immunity and some light stretching to keep stiffness away. 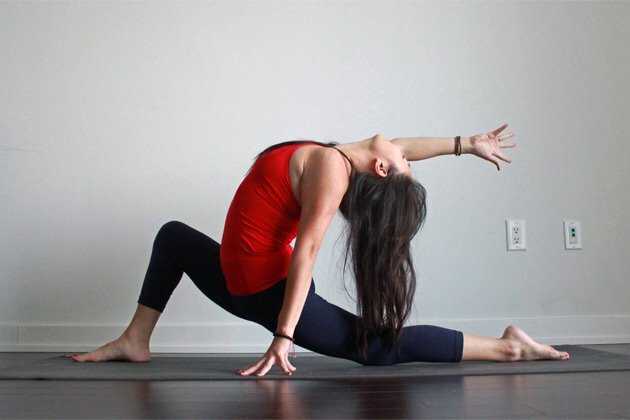 Here are 5 yoga poses that can help you stay relaxed and mobile after a long flight. All of these are seated asana that you can do right in the airport waiting areas before you board. This seated forward fold is a pre-flight favorite. Forward bends are cooling and calming. They help slow down the heart rate and reduce cortisol levels. This is beneficial to keep you grounded and relaxed on stressful travel days. Lord of the fishes twist can be done with the bottom leg straight or bent. It is a great Asana to release the back and help detoxify the body before a long flight. Look over the back shoulder to complete the twist and help release the neck. Fire log pose (also called Double Pigeon) is an intense hip opener. Sitting for long periods of time in confined spaces can certainly make the hips cramp up. Trying out this pose before you board the plane will help keep your hips a little looser for the duration of your travels. If this pose isn’t okay on your knees, turn the back leg behind you (heel toward buttocks) and fold the body over the front leg. This will still have the same stretchy benefit but be much more gentle on the knees. Cow face pose is another great hip opener with the added benefit of a deep shoulder stretch. All those hours hunching in your plane seat and playing on your iPad can cause the shoulders to slump and ache. Opening up the shoulders and chest before your flight will keep you in top shape when you land. Low lunge is perfect to open the hip flexors that get pretty compressed while seated. Practice any variation of low lunge that feels right for your body before your fly. This could be widening the legs and dropping the elbows to the ground, keeping the body upright and the hands on the front knee or maybe even side bending in your lunge. This will help keep the torso and hips from stiffening up during the flight. Long flights can certainly be tiring both mentally and physically. But with a little love and self-care they can be far less turbulent. Find a quiet area, and enjoy these five stretches before your next flight. You’re guaranteed to arrive a little less stiff and a lot more refreshed.